Republic should never have gotten into the mainline business. It looks attractive now that it is refocusing on regional operations. Back in the depths of the Great Recession, regional airline operator Republic Airways (NASDAQOTH:RJETQ) made an opportunistic leap into mainline service with the purchase of two small, troubled carriers, Midwest Airlines and Frontier Airlines. At the time, The Wall Street Journal speculated that Republic hoped to salvage investments it had made in the two carriers, while taking over more of their flying. The move turned into a disaster. 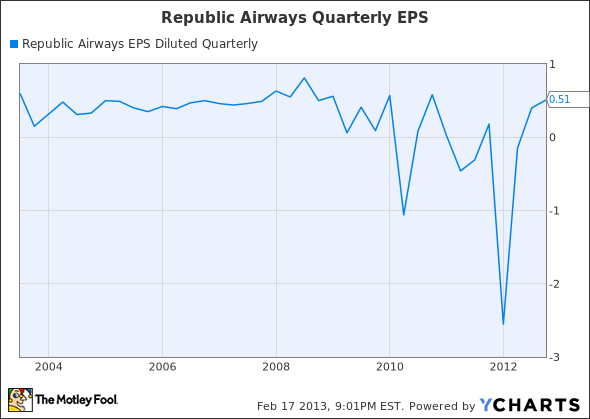 While Republic had previously produced reliable (and growing) EPS, the company's earnings turned volatile and Republic posted several ugly losses. Republic eventually phased out the Midwest brand and now operates all of its mainline service as Frontier Airlines. Moreover the company has returned to profitability. Additionally, Republic plans to spin off Frontier Airlines during 2013, which could be a catalyst for the stock to move higher. While experts debate whether corporate spin-offs create value or not, Republic's struggles in the past few years are proof enough that Republic and Frontier are better apart. Both halves of the company are likely to see better stock performance after the spinoff occurs. There are big differences between operating a regional carrier and running a mainline "branded" airline. For regional carriers, flights are marketed under the partner airline's name, (e.g. 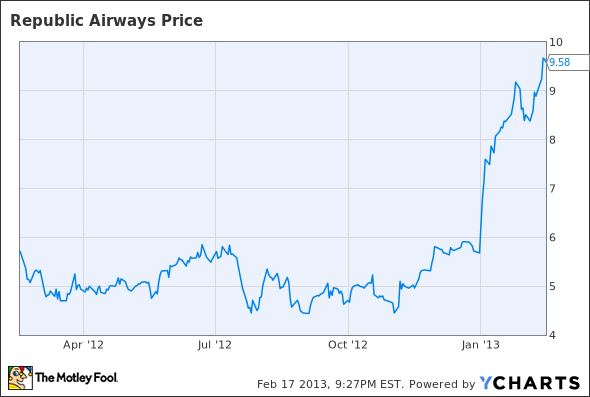 United (NASDAQ:UAL) Express), and the latter also sells all the tickets. The regional carrier receives a fixed fee, typically through an arrangement called a "capacity purchase." Since the mainline partner is responsible for filling the plane, regional carriers can focus solely on keeping costs low. By contrast, for a mainline carrier to be profitable, it must fill its seats at acceptable prices, in addition to keeping costs in check. Republic learned this distinction the hard way after acquiring Midwest and Frontier. In Milwaukee, Midwest Airlines had already come under pressure from AirTran in the years leading up to Republic's 2009 acquisition of Midwest. AirTran's lower-cost model allowed it to undercut Midwest's fares and gradually chip away at its market share. Then, low-fare leader Southwest Airlines (NYSE:LUV) entered the market in late 2009. Southwest's purchase of AirTran has now given it a dominant share of traffic in Milwaukee. Midwest (which was eventually folded into Frontier) could not compete, and the Milwaukee hub was eliminated in stages. A similar pattern of events occurred in Denver, Frontier's main hub. Southwest entered the market in 2006, seeing it as strategically important. Southwest tried to acquire Frontier after the latter declared bankruptcy in 2008, but was outbid by Republic. However, Southwest grew rapidly in Denver, which is now its fifth-largest focus city with 152 daily departures. Frontier is now in the unfortunate position of being the No. 3 carrier in its home market, behind Southwest and market leader United Continental. Heavy competition thus weighed down performance at both Midwest and Frontier after they were acquired by Republic. However, Republic's performance is finally improving, in both its "legacy" regional operations and the Frontier subsidiary. A restructuring at Frontier has cut costs while improving revenue performance. Frontier has focused on cutting short routes in favor of longer, more profitable trips. As part of this strategy, the carrier is dropping service in Colorado Springs, previously one of its biggest markets. Instead, Frontier is starting to build a small focus city operation at Trenton-Mercer Airport, a small New Jersey airport roughly halfway between major airline hubs in Newark and Philadelphia. Frontier has already begun flights from Trenton to various warm weather destinations, and is planning to add service to several major East Coast and Midwest cities in April. The carrier is banking on convenience and low fares to attract leisure travelers to Trenton, where it faces no direct competition. So far, the service appears to be a success. Meanwhile, Republic's renewed focus on its regional operations is improving performance. Like many operators of small regional jets (50 seats or less), the company's Chautauqua Airlines subsidiary has been hurt by rising fuel prices, which have made these aircraft generally uneconomic to operate. However, Republic has reduced its exposure to this market, and is in the midst of restructuring Chautauqua to improve cash flow by $60 million annually. Furthermore, Republic is benefiting from the industry shift toward larger regional aircraft. Last year, the company's Republic Airlines subsidiary signed an agreement with United Continental to operate 32 large Q400 turboprop aircraft, replacing flying done by now-defunct Colgan Air. More recently, Republic won a contract from American Airlines to operate 53 large regional jets for 12 years. As a result, the company has ordered 47 new Embraer (NYSE:ERJ) 175 aircraft, with options for another 47. Since all three major legacy carriers are looking to increase their usage of large regional jets, there is a significant growth opportunity here. Republic traded between $4 and $6 for most of the past year, but jumped more than 50% last month following a bullish investor update. However, even at last week's closing price of $9.58, Republic trades at just above six times the average analyst estimate for 2013 EPS of $1.56. Republic's rapidly improving fundamentals make the company an intriguing value play at this time. The expected spinoff of Frontier Airlines later this year should also improve shareholder returns, as the two businesses have minimal synergies and should benefit from being managed separately.